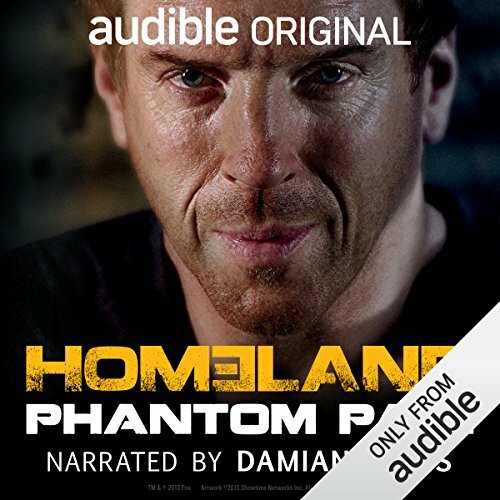 Emmy Award-winner Damian Lewis, who stars as Former Congressman and U.S. Marine Sergeant Nicholas Brody in the hit series Homeland, narrates this original Homeland story of Brody's journey into exile. Picking up at the end of Season 2 after he has parted from Carrie at the border, Brody relates, in the form of a letter to Carrie, his desperate escape by sea and land as the world's most-hunted fugitive. Guided off the grid by a former CIA analyst and a battle-scarred French mercenary, he stays in the shadows...both physically and emotionally. But wherever he goes and whoever he meets, he cannot stop thinking about Carrie. This powerful audio-only story is the perfect complement to your Season 3 viewing, and a great way for current and new fans to get to know what drives one of the most fascinating characters on television. ©2013 Twentieth Century Fox Film Corporation. All Rights Reserved. (P)2013 Audible, Inc. This short story is a great bridge between Seasons Two and Three of the TV Show. Damien Lewis does his usual outstanding job as the character Brody, but also as the additional characters in this short story. What did you love best about Homeland: Phantom Pain? I loved that they're adding extra dimension to the Showtime Series. That was so nice to get, and I'm sure that the production cost is alot less than filming. This is a great way to add to the story and build so much more than just what's shown during the airing of the actual episode. What was one of the most memorable moments of Homeland: Phantom Pain? I thought that Brody's realization that running was the absolute wrong thing to do was the most memorable. Which character – as performed by Damian Lewis – was your favorite? I don't remember the character's name, but I loved the French guy that was helping get him along in Central America. I thought that was very well done! Please do more of these with the other characters. This one was terrific, but I would love to see more of the story fleshed out in this way. I think that the writers and creators of Homeland are really on to something with this. I really hope they keep moving forward with it, and it becomes more common not just with Homeland, but with other great series/stories. I like the idea that we're getting a little bit extra. Damian Lewis' acting is superb and his voice is easy to listen to. A fun 30 min. Not being sure what to expect, but in the end, I was sad to hear the story end. In the beginning, not knowing about the story, I was trying to grasp the point of the story. But once I did, it pulled me in and made me want to know more. Great story that I hope they add too. Amazing; the best short listen in a long time. The dialogue discussing "phantom pain"; brilliant writing, wonderful narration. Well, I guess it would have to be Brody. But please, Damian, narrate more books. I actually listened to it on a short dog walk; good thing about audio is you don't have to sit. This audio book was really cool because it fills in most of the gap of Brody's life between season 2 and season 3. The way Damian Lewis reads the script and the descriptive qualities of the writing make you feel as if you are really there. You can almost pretend like you're watching an episode or if you were there with Brody, sharing in his anguish. I'd recommend this to anybody who likes Homeland and is curious to know more about Brody's route and journey to...(I don't want to spoil anything). This adds a whole other element to Brody's experience and his character. It might change some people's view of Brody and really understand what he is and has gone through. A really heartfelt and thrilling story overall and if you love Brody like I do, you might love him a little more! Damian Lewis is brilliant and his narration is so compelling, it doesn't even matter that you're not looking at him or a TV while listening to it. While this short book doesn't change what you know about current plot of Homeland, it is a good add on to learn about how Brody is feeling this season. We know so little about his journey, and this book helps fill in some of holes. Damian Lewis is great and Homeland fans will enjoy this book. Would you consider the audio edition of Homeland: Phantom Pain to be better than the print version? The French agent. He was the voice of truth. It was sad, tragic. As all viewers now know, it was a mistake to run. The sound quality was a bit muffled but, I would enjoy additional stories like these! If you are not watching the series I doubt this would appeal to you but for the rest of us it was just about perfect. Oh did I mention free! As the headline infers, this was a neat wee addition to the end of the second season. As usual, I like the addition of background music as I feel it brings more to a performance and the lisp that Lewis tends to have in the TV show with his American accent had mysteriously disappeared! Really enjoyed this one. It's an intriguing story and the reading couldn't be better. Highly recommended. Which character – as performed by Damian Lewis – was your favourite? If you could sum up Free: Homeland: Phantom Pain in three words, what would they be? Not Happy Camper - Brodie that is. It is set in a time when Brodie is missing / off the grid - a time and setting that Homeland fans are very aware of but know nothing much about...which is really interesting. What does Damian Lewis bring to the story that you wouldn’t experience if you had only read the book? He is Brodie so it seems only fitting that he should read a story that is 100% about Brodie. Would you try another book written by Glenn Gers or narrated by Damian Lewis? Damien Lewis is obviously playing his character Brodie, which he does fantastical. The style and pacing was good. Do you think Free: Homeland: Phantom Pain needs a follow-up book? Why or why not? No, it leads up to the 3 TV series and fills in the gap we don't see in the show. Good little listen if you are a fan of the show. Would you listen to Free: Homeland: Phantom Pain again? Why? I watched the tv series and really enjoyed it. When this freebie was available I was very pleased! I was impressed with the narration and thought that having Damian narrate was a good decision. It was a perfect pace. I would recommend this. Have you listened to any of Damian Lewis’s other performances? How does this one compare? I have not listened to any other performances by Damian but would now. Having Damian Lewis narrate the story added a level of authenticity. Really well paced for a short story. This was a great addition to the Homeland canon. In a season that has sometimes lost Brodie for whole episodes at a time this was a nice way of bridging the story of his flight from the US. The central metaphor is also very clever but I'll let you discover that for yourself. What was one of the most memorable moments of Free: Homeland: Phantom Pain? What about Damian Lewis’s performance did you like? It's difficult to write a short story alongside a well-established series. You can't add any plot details that influence the main story. So you have to do something safe and self-contained. This story suffers a bit from that - it describes what happens to Brodie whilst he's escaping, but doesn't really do much else. We know (if we've watched the TV series) that he eventually arrives somewhere, so there's no real jeapordy. Well read by Damian, and okay for whiling away a short while, but not startling (for the reasons above). This short listen is a great addition to the Homeland story. If you are a fan of the TV show and are up to date with it then this will definitely enrich your viewing experience as it details what happened to Brody after Carrie left him at the Canadian border. After listening to it I felt that I knew the character and the story better - like I had been let in on a secret backstory dreamed up in the Homeland writers room. The fact that Damian Lewis narrates it just adds to the authenticity of Brody's story.